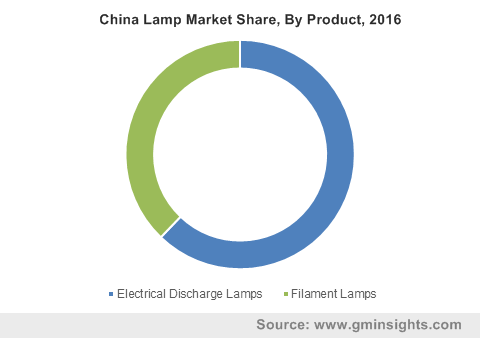 Lamp Market size exceeded USD 40 billion in 2016, with global shipments of over 32 billion. Increased usage in various indoor and outdoor applications such as residential, commercial, industrial, highways, and automobiles has augmented the lamp market growth. Government initiatives for increasing lighting facilities in rural areas has increased the overall industry demand. The U.S. Department of Energy has issued new regulations related to the efficiency of fluorescent lamp ballasts which took effect from November 2014. These rules have created new metric standards for measuring ballast efficiency and have established efficiency standards impacting many fluorescent T5, T8, & T12 ballasts in the industry. According to the rules, these ballasts are expected to save about 5.6 quads of energy resulting in USD 24.1 billion in energy savings for the products shipped from 2014 – 2043. These standards are estimated to avoid 106 million metric tons of CO2 emissions. The ban on incandescent bulbs will negatively affect the lamp market as the consumers are shifting toward modern technologies such as LEDs and CFLs that save energy and are highly-efficient alternatives for these bulbs. High energy consumption costs of bulbs as compared to LED lamps act as a restraint for this industry. Halogen and fluorescent bulbs produce more heat and thus result in more energy consumption. LEDs utilize 90% less energy and last approximately 15 times longer than the halogen bulbs. Moreover, government initiatives across the globe for the implementation of LED use has negatively affected the lamp market demand. Electric discharge lamp market share is anticipated to display a significant growth rate in the coming years. Rising demand of CFLs over the past decade has fueled the revenue growth across this segment. The long life, efficiency, and reliability benefits offered by these bulbs testifies their rising adoption. Indoor applications occupied the largest revenue share and are anticipated to continue dominating the industry in the forecast timeframe. Growing lamp market adoption in the residential, commercial, and industrial sectors will drive the industry demand. Improvement in living standards, growing awareness about adopting energy efficient bulbs, has fueled the demand across the residential sector. Household, hospitality, and healthcare segments are increasingly implementing halogen and fluorescent bulbs, which has positively impacted the industry growth. Several types of CFLs include A-Line bulbs that are commonly used in households. The need for energy saving bulbs and the rising consumer preference toward energy efficient products will offer growth opportunities to the U.S. lamp market. The demand for CFLs has increased in the UK due to phasing out of incandescent lamps; this will augment the lamp market demand over the forecast time frame. Retrofitting energy efficient products is a major trend observed in the regional landscape. Subsidies provided by the governments of key regions such as Brazil and Mexico is expected to lower the product costs. In Mexico, incandescent light bulbs are more commonly used in residential areas owing to their low-cost and longer product life. The presence of many competitors is credited to low-cost and abundance of raw materials. This, in turn, will reduce the input costs and offer consumers a wide variety of alternatives. GE, Philips, and Osram are some of the major competitors in the lamp market. Technological advancements in bulbs such as high-efficiency ballasts are being widely adopted across the industry. Manufacturers are implementing aggressive strategies to gain a competitive edge. Mergers, collaborations, and partnerships are a few strategies adopted by the industry players. Some companies acquire local and regional players to increase their lamp market share. For instance, in 2015, GE acquired Alstom Thermal Company which is involved in power generation and transmission. High-efficiency ballasts are produced for increased efficiency of the bulbs. Manufacturers are focusing on the maximization of energy savings and making ballasts more energy efficient. High-efficiency ballasts have obtained standards in a variety of wattages with technological advancements. Electric discharge bulb consists of a transparent container in which a gas is energized by the voltage applied that makes it glow. They are classified into fluorescent and high-intensity discharge bulbs. Fluorescent bulbs are low-weight mercury vapor bulbs which utilize fluorescence to produce visible light. They consist of a glass tube with phosphorus coating, mercury, a small amount of inert gas, and a set of electrodes. A fluorescent lamp generally provides 25-35% energy savings. Moreover, they do not produce as much heat as halogen or incandescent bulbs. Filament bulb consists of an electrical conductor or filament that produces light on a passage of current. They are classified into halogen and incandescent lamps. Halogen bulbs use halogen gas to increase rated life and light output. They provide higher rated life, light quality, and energy efficiency than regular incandescent lamps. These bulbs are generally used in automotive headlights, work lights, and under-cabinet lighting.